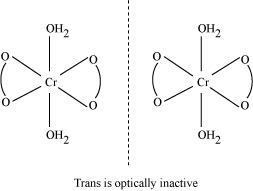 Both geometrical (cis-, trans-) isomers for can exist. Also, optical isomers for cis-isomer exist. (ii) Two optical isomers for exist. 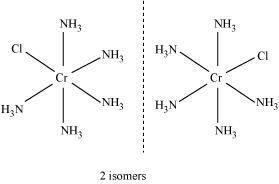 Give evidence that [Co(NH3)5Cl]SO4 and [Co(NH3)5SO4]Cl are ionization isomers. planar structure is diamagnetic and the [NiCl4]2− ion with tetrahedral geometry is paramagnetic. There are 4 CN− ions. Thus, it can either have a tetrahedral geometry or square planar geometry. Since CN− ion is a strong field ligand, it causes the pairing of unpaired 3d electrons. In case of [NiCl4]2−, Cl− ion is a weak field ligand. Therefore, it does not lead to the pairing of unpaired 3d electrons. Therefore, it undergoes sp3 hybridization. [NiCl4]2− is paramagnetic while [Ni(CO)4] is diamagnetic though both are tetrahedral. Why? 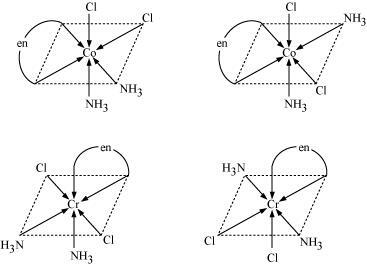 Though both [NiCl4]2− and [Ni(CO)4] are tetrahedral, their magnetic characters are different. This is due to a difference in the nature of ligands. Cl− is a weak field ligand and it does not cause the pairing of unpaired 3d electrons. Hence, [NiCl4]2− is paramagnetic. [Fe(H2O)6]3+ is strongly paramagnetic whereas [Fe(CN)6]3− is weakly paramagnetic. Explain. 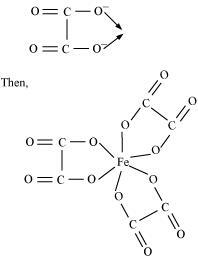 In both and , Fe exists in the +3 oxidation state i.e., in d5 configuration. Since CN− is a strong field ligand, it causes the pairing of unpaired electrons. Therefore, there is only one unpaired electron left in the d-orbital. Thus, it is evident that is strongly paramagnetic, while is weakly paramagnetic. Explain [Co(NH3)6]3+ is an inner orbital complex whereas [Ni(NH3)6]2+ is an outer orbital complex. 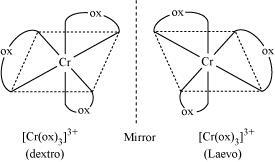 Predict the number of unpaired electrons in the square planar [Pt(CN)4]2− ion. The hexaquo manganese(II) ion contains five unpaired electrons, while the hexacyanoion contains only one unpaired electron. Explain using Crystal Field Theory. The crystal field is octahedral. Water is a weak field ligand. Therefore, the arrangement of the electrons in is t2g3eg2. The crystal field is octahedral. Cyanide is a strong field ligand. Therefore, the arrangement of the electrons in isT2g5eg0. Calculate the overall complex dissociation equilibrium constant for the Cu(NH3)42+ ion, given that β4 for this complex is 2.1 × 1013. The overall complex dissociation equilibrium constant is the reciprocal of the overall stability constant, β4. Explain the bonding in coordination compounds in terms of Werner’s postulates. FeSO4 solution mixed with (NH4)2SO4 solution in 1:1 molar ratio gives the test of Fe2+ ion but CuSO4 solution mixed with aqueous ammonia in 1:4 molar ratio does not give the test of Cu2+ ion. Explain why? Both the compounds i.e., and fall under the category of addition compounds with only one major difference i.e., the former is an example of a double salt, while the latter is a coordination compound. A double salt is an addition compound that is stable in the solid state but that which breaks up into its constituent ions in the dissolved state. These compounds exhibit individual properties of their constituents. For e.g. breaks into Fe2+, NH4+, and SO42− ions. Hence, it gives a positive test for Fe2+ ions. Explain with two examples each of the following: coordination entity, ligand, coordination number, coordination polyhedron, homoleptic and heteroleptic. The neutral molecules or negatively charged ions that surround the metal atom in a coordination entity or a coordinal complex are known as ligands. For example, , Cl−, −OH. Ligands are usually polar in nature and possess at least one unshared pair of valence electrons. What is meant by unidentate, didentate and ambidentate ligands? Give two examples for each. (a) Unidentate ligands: Ligands with only one donor sites are called unidentate ligands. For e.g., , Cl− etc. The charge on the complex is −2. List various types of isomerism possible for coordination compounds, giving an example of each. How many geometrical isomers are possible in the following coordination entities? (i) For [Cr(C2O4)3]3−, no geometric isomer is possible as it is a bidentate ligand. 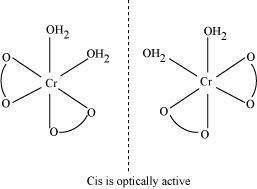 Optical isomerism Since only cis isomer is optically active, it shows optical isomerism. In total, three isomers are possible. Write all the geometrical isomers of [Pt(NH3)(Br)(Cl)(py)] and how many of these will exhibit optical isomers? In both these cases, the weak field ligand water is replaced by the F− and Cl− ions. What is the coordination entity formed when excess of aqueous KCN is added to an aqueous solution of copper sulphate? Why is it that no precipitate of copper sulphide is obtained when H2S(g) is passed through this solution? Thus, the coordination entity formed in the process is K2[Cu(CN)4]. is a very stable complex, which does not ionize to give Cu2+ ions when added to water. Hence, Cu2+ ions are not precipitated when H2S(g) is passed through the solution. As CN− is a strong field ligand, it causes the pairing of the unpaired 3d electrons. 6 electron pairs from CN− ions occupy the six hybrid d2sp3orbitals. There are 6 F− ions. Thus, it will undergo d2sp3 or sp3d2 hybridization. As F− is a weak field ligand, it does not cause the pairing of the electrons in the 3d orbital. Hence, the most feasible hybridization is sp3d2. Hence, the geometry of the complex is octahedral and paramagnetic. Draw figure to show the splitting of d orbitals in an octahedral crystal field. 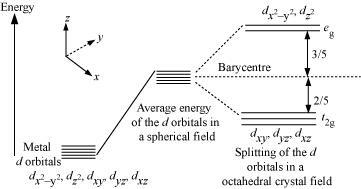 The splitting of the d orbitals in an octahedral field takes palce in such a way that , experience a rise in energy and form the eg level, while dxy, dyzand dzx experience a fall in energy and form the t2g level. What is spectrochemical series? Explain the difference between a weak field ligand and a strong field ligand. What is crystal field splitting energy? How does the magnitude of Δo decide the actual configuration of d-orbitals in a coordination entity? [Cr(NH3)6]3+ is paramagnetic while [Ni(CN)4]2− is diamagnetic. Explain why? In [Ni(CN)4]2−, Ni exists in the +2 oxidation state i.e., d8 configuration. CN− is a strong field ligand. It causes the pairing of the 3d orbital electrons. Then, Ni2+ undergoes dsp2 hybridization. A solution of [Ni(H2O)6]2+ is green but a solution of [Ni(CN)4]2− is colourless. Explain. In [Ni(H2O)6]2+, is a weak field ligand. Therefore, there are unpaired electrons in Ni2+. In this complex, the d electrons from the lower energy level can be excited to the higher energy level i.e., the possibility of d−d transition is present. Hence, Ni(H2O)6]2+ is coloured. In [Ni(CN)4]2−, the electrons are all paired as CN– is a strong field ligand. Therefore, d-d transition is not possible in [Ni(CN)4]2−. Hence, it is colourless. [Fe(CN)6]4− and [Fe(H2O)6]2+ are of different colours in dilute solutions. Why? The colour of a particular coordination compound depends on the magnitude of the crystal-field splitting energy, Δ. This CFSE in turn depends on the nature of the ligand. In case of [Fe(CN)6]4− and [Fe(H2O)6]2+, the colour differs because there is a difference in the CFSE. Now, CN− is a strong field ligand having a higher CFSE value as compared to the CFSE value of water. This means that the absorption of energy for the intra d-d transition also differs. Hence, the transmitted colour also differs. Discuss the nature of bonding in metal carbonyls. The metal-carbon bonds in metal carbonyls have both σ and π characters. A σ bond is formed when the carbonyl carbon donates a lone pair of electrons to the vacant orbital of the metal. A π bond is formed by the donation of a pair of electrons from the filled metal d orbital into the vacant anti-bonding π* orbital (also known as back bonding of the carbonyl group). The σ bond strengthens the π bond and vice-versa. Thus, a synergic effect is created due to this metal-ligand bonding. This synergic effect strengthens the bond between CO and the metal. The d orbital occupation for Co3+ is t2g6eg0. What is meant by stability of a coordination compound in solution? State the factors which govern stability of complexes. What is meant by the chelate effect? Give an example. How many ions are produced from the complex Co(NH3)6Cl2 in solution? Thus, [Co(NH3)6]+ along with two Cl− ions are produced. Amongst the following ions which one has the highest magnetic moment value? Therefore, the complex can be written as K+[Co(CO)4]−. 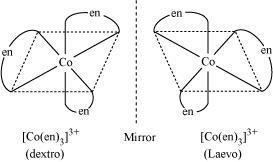 Therefore, the oxidation number of Co in the given complex is −1. Hence, option (iii) is correct. We know that the stability of a complex increases by chelation. Therefore, the most stable complex is [Fe(C2O4)3]3−.